Though it is common to consider smaller vessels like canoes and kayaks to be for short excursions only, this is far from what history has shown. Indigenous canoes of coastal tribes regularly traveled hundreds of miles on trade journeys, powered often by seven or more Native Americans. The Inuit regularly hunted the entire Aleutian island chain stretching between North America and Asia (Russia) aboard one-man sea kayaks designed to roll through the surf. All of the archipelagos of the South Pacific were first discovered by outrigger canoe. Small vessels are light, can travel in shallow, treacherous water without danger of running aground, and are often designed to move more easily in choppy water than a larger boat would. They are ideal for long trips down rivers and along coastlines, and can create an experience so close to the water that things like whale watching become even more huge and magical. If you are considering a multi-day trip on a small boat, read this article for tips. Unlike traveling on a boat with sleeping quarters, taking a canoe or kayak on a multiday journey requires considering where you will sleep each night. Because many islands and shorelines are private property, this is not as simple as just pulling ashore and pitching a tent. Fortunately, a number of marine highways have popped up in areas like Puget Sound, Washington to allow for a safe sleeping location that will not end with a complaint of trespassing. For river-goers, there are a number of rivers that stretch through areas of wilderness where any spot is fair game. The key is to map your journey well enough to figure out where these safe locations lie, to plan distances between them, and ensure that you have a safe and legal place to sleep for the night. Though maybe not as romantic or spontaneous as just stopping anywhere, camping in a marine park does have an added bonus: toilets you will not need to take with you (more on this later). Finally, do your homework about whether a permit is required. They are often free or of minimal cost, and work like a float plan to let authorities know to come find you if you do not check in within a certain time frame. Of course, for those who are just kayaking from marina to marina and staying at hotels, much of this information may not be necessary. But reservations are definitely necessary to keep from having to sleep under an upside-down canoe on the beach because there is no vacancy. Finally, check and recheck the weather report to make sure that there are no unexpected storms or other weather occurrences that will make your trip miserable. It is better to postpone than to travel in dangerous conditions or the kind of weather that will make you never want to do this again. When packing, it is important to distribute the weight not only between boats, but within a boat. Heavy either goes in the middle of a canoe or gets distributed evenly between the two ends of a kayak. Do not fall in love with one gear configuration. As heavy liquids get used and other items get heavier with packed out waste, new versions of evenly weighted will be needed. Also, if you are switching up partners in a group paddle, differently weighted items can be used to balance out weight discrepancies in a boat and make it float more securely. The two goals for gear in a boat are that the weight is evenly distributed, and the gear is well-secured into the boat. Kayaks have closed chambers for this. Canoes can use tie-down straps instead. It is important when camping on a water body to be very careful about where and how you dispose of your human waste. Many campers will bring a small port-a-potty for solid waste to avoid too much contamination of the waterway. If you are unwilling to do this, a shovel and a willingness to walk a few hundred feet from a shoreline or riverbank is necessary to keep contamination out of the water. Garbage should always be packed out with you, including compostable items. Do not leave your food for nature to dispose of. If you are traveling in an area with larger boats, it is important to consider ways to be well seen or protected. Stick to the shoreline as much as possible to avoid larger boats. The shallower you travel, the harder it is for someone to accidentally hit you. When crossing big areas or shipping lanes, stay close with your group, wear bright colors and have a whistle or air horn in arms reach at all times. Take the shortest route between two points, and go directly without dawdling to minimize the time where you are vulnerable to vessel hits. While small pleasure crafts may see you and avoid you, larger vessel traffic like freighters may not be able to stop in time. If you are regularly in an area like this, there are radar reflectors for small boats like kayaks that can be purchased to help become more visible. Choose your route based on the skills of your weakest boater. This will keep everyone safe. Have someone trained in first aid safety if you are attempting anything risky. Do not attempt anything that exceeds the safe water levels/conditions that should be expected. High/low rivers or storms are not the time to try something new and unfamiliar. If you are traveling with a larger group, nature may not be the most difficult thing to face. Instead, social dynamics may prove to be the more difficult part. There are two parts to what can make a larger boating group hard. The first is the differences in physical shape between groups. This can lead to a group that travels far from one another and frustrates themselves with unequal speeds and distances. The second is personality conflicts between boating partners. Both of these can be preempted, however, by suggesting that partners are switched up on occasion. This can keep an overly fast, slow, or argumentative pair from ruining the trip for everyone. 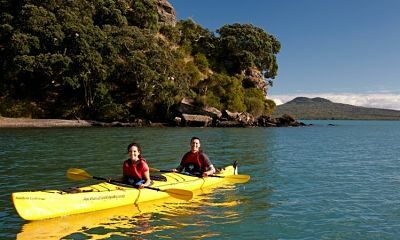 Kayak and canoe multi-day trips can be lovely times to contemplate nature and explore uncharted territories. They can be feats of athleticism that help boaters to remember their childhood days of playing outside all day long. They can be adrenaline-filled adventures of whitewater and tidal convergences. They can be mystical encounters with whales and sea lions. The journey is up to you. By planning well, you can ensure that the trip is everything that you are hoping for, without any of the things you are not.